June 4th, 2017, SANTA MONICA AUCTIONS Offers Amazing Deals on Collectible Art! On Sunday, June 4th, SANTA MONICA AUCTIONS will host its annual June auction commencing at noon at Bergamot Station in Santa Monica. For thirty-eight years the SANTA MONICA AUCTIONS had been offering a place for collectors and the general public to obtain exceptional deals on modern and contemporary art. Featuring both emerging and established artists, this exclusive secondary market auction has something for everyone…paintings, prints, multiples, photographs and sculpture. This year’s works to be auctioned include a self-portrait by Chuck Close features the artist’s unique style of pixelated spots. 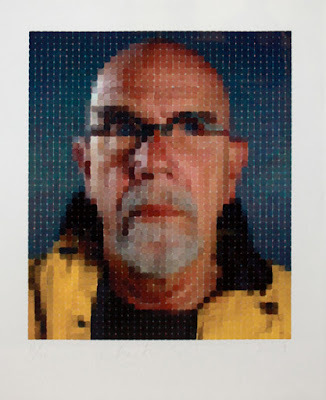 The Self Portrait (Yellow Raincoat), 2013 should fetch between $8,000/$10,000. One hundred percent of the hammer sale price will go to the Compassionate Touch Network based in New Mexico, who are committed to promoting mental health literacy for youth, teens and adults utilizing education and the arts. Another rare, never before seen piece by Richard Pettibone is getting lots of attention. Acclaimed for his “pocket-sized” appropriations of modernist masters, Pettibone’s work is highly sought after, now more than ever. This unique piece is a rare “combine” which features multiple modern master works within one miniature canvas - Roy Lichtenstein, Frank Stella and two Andy Warhol infamous images. This year’s auction includes artists such as: Raymond Pettibon, Robert Rauschenberg, David Hockney, Pablo Picasso, Chuck Close, Alex Prager, Larry Bell, Keith Haring, Christopher Wool, Ed Moses, Man Ray, Barry McGee and many others. Billy Al Bengston’s Ka’ao Watercolor, (1983) is still in its original frame. The watercolor collage has a strong provenance…it has been shown in established galleries. A Dennis Hopper silkscreen was created from a photograph and is a special addition to the auction. 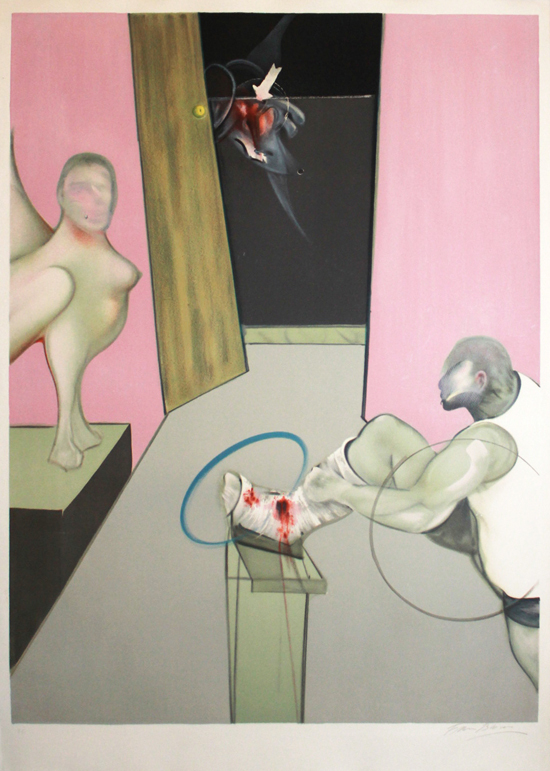 Another highlight is a Lithograph by Francis Bacon set to sell between $14,000/$16,000. 150 copies with Arabic numbering, together with a number of “Hors Commerce” proofs and E.A. You never know what to expect at the popular event, this may be your lucky day. Stop by prior to the auction and ask questions. Both Robert Berman and his staff are quite knowledgeable and more than happy to help. Call (310) 315-1937 with any questions or stop by SANTA MONICA AUCTIONS (A-7) or THE ROBERT BERMAN GALLERY AT B-7. The auction preview is currently on view now at the A-5 & B-7 galleries at Bergamot Station (Tues-Fri 11-6pm) and will remain open until 7pm on Saturday, June 3rd. SANTA MONICA AUCTIONS is located at the famed Bergamot Station at 2525 Michigan Avenue in Santa Monica. For additional info and to view all works see www.smauctions.com.